Many people tend to think alcohol problems apply only to those that drink excessively, or who are addicted to alcohol. Truth is, any amount of alcohol can be detrimental to your health, and for those that drink beyond sensible drinking limits, the results could be devastating to your body and overall health. So exactly what does alcohol do to you? Aside from the dreaded hangover the next day, your body may be trying to tell you something, and you should pay close attention to the signs. Anybody that has had a bit too much to drink recognizes some of the immediate effects, such as nausea and vomiting; however binge drinking and heavy drinking over a long period of time can wreak havoc on your body in many different ways. Alcohol has been known to cause damage to the brain affecting the ability to learn and remember along with behavioral problems. Younger teens are especially vulnerable, because their brains are still not fully developed. Binge drinkers often experience blackouts, anxiety, and permanent memory loss, and those that drink excessively over long periods of time risk alcohol dependency, permanent brain damage, and serious mental health issues. Second only to smoking, the biggest risk for cancers of the throat and mouth are attributed to alcohol, and those who drink too much alcohol risk their chances of liver cancer. Women too, need to pay particular attention to how alcohol changes their body’s hormone levels, especially estrogen. This hormone has been known to increase the risk of breast cancer, and the bottom line is, the more you drink, the greater the risk. What does alcohol do to you? It impacts you mental status. People who self-medicate themselves with alcohol to help them cope with life's difficult situations such as stressful emotions or anxiety, in fact increase their risk for mental health issues. These risks include depression, sleep pattern disruption, anxiety, personality disorders, risk-taking behavior, and even schizophrenia. Alcohol has even been linked to suicidal behavior by the Mental Health Foundation, noting that 65% of suicides have been linked to excessive drinking. Those that drink alcohol in excess tends to also get more lung infections, including collapsed lungs and pneumonia. This is the result of the inhalation of fluids into the lungs when passed-out from too much alcohol. Some are even killed by asphyxiation (drowning), when vomiting while unconscious or during an inebriated induced sleep that fails to wake them. Chronic alcohol abuse can scar and permanently damage the liver, especially in women. Excessive drinking initially causes fat deposits to develop in the liver, often leading to cirrhosis and liver cancer. Additionally, when the liver becomes inflamed from too much alcohol it can also overwhelm the organ’s ability to break down harmful substances resulting in liver hepatitis, organ failure, and eventually death. Binge drinking and long term alcohol abuse lead to complications to the circulatory system. Some of these symptoms include irregular heartbeat (arrhythmia), damage to heart muscle cells (cardiomyopathy), high blood pressure, stroke, and organ failure. In some cases only a single episode of binge drinking can cause problems for your heart, and chronic drinkers are at an even higher risk. Women who drink have higher risks than men do, and people with diabetes increase their risk for low blood sugar levels. One common side effect of alcohol abuse in men is erectile dysfunction (ED). The alcohol inhibits hormone production, affects testicular function, and causes infertility. For women, excessive drinking can stop menstrual cycles, causing infertility. Moreover, the risk of miscarriage, premature birth and stillbirth are all increased when consuming alcohol during pregnancy. Additionally, those children born to mothers who are chronic drinkers risk adverse effect on fetal development. Fetal alcohol spectrum disorders (FASD) include physical abnormalcies, emotional problems, and life-long learning disabilities. What does alcohol do to you? Chronic and long term alcohol abuse have an adverse effect on the body’s ability to produce new bone. Heavy drinking will put a person at risk of developing osteoporosis (brittle bones). Osteoporosis will cause bones to become so weak and brittle that a fall, or mild stresses on bone cause a fracture, mainly in the hip, wrist or spine. In addition to bones, muscles can also become atrophied, leading to muscle cramps, and muscle weakness. Binge drinking and long term alcohol abuse weaken the immune system. This leaves the body vulnerable to disease caused by viruses, germs, and many other maladies that we are exposed to in our daily lives. With a compromised immune system heavy drinkers risk more serious disease such as pneumonia and tuberculosis. 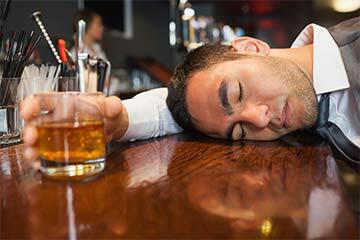 Alcoholics and heavy drinkers sometimes develop anemia. Alcoholism can abnormally lower the number of oxygen-carrying red blood cells. This alcohol induced anemia triggers many symptoms, includingfatigue, lightheadedness, and shortness of breath. People suffering from anemia may appear pale, and also have worsening heart problems, all the result of deficient red blood cells. People who are already overweight need to pay particular attention to how much they drink, because heavy drinking helps facilitate a condition called diabetes. This life threatening condition is manageable with medication or insulin injections, but also leads to a shorter life span with a critical eye on dietary needs. What does alcohol do to you? It may lead to pancreatitis. The pancreas is an organ that makes enzymes used for digestion, and alcohol is the second highest cause of pancreatitis (inflammation of pancreas). Signs of pancreatitis begin as a pain just below your ribs and may last for several days. When it becomes severe and persistent, acute pancreatitis could lead to organ failure and death. A unit of alcohol equals approximately one half pint of regular strength lager, beer, or cider. Strong beer at 6% has six units in one liter.A small glass of regular strength wine contains approximately one and a half units of alcohol. Strong wine at 14% has 14 units in one liter.A regular measure of spirits (40% alcohol by volume), contains approximately one and a half units of alcohol. Recommendations for men are no more than 21 units weekly and no more than four units in a day and remain alcohol-free at least two days a week. Women should not drink more than 14 units per week, no more than three units in a day, and have at least two alcohol-free days a week. Women who are pregnant should totally abstain from alcohol consumption. Women who choose to drink anyway need to be aware of the risks to the baby, and limit themselves to no more than 1-2 units once or twice weekly.